When I first started planning a trip to the Arctic Circle, my sole plan was to see the northern lights. 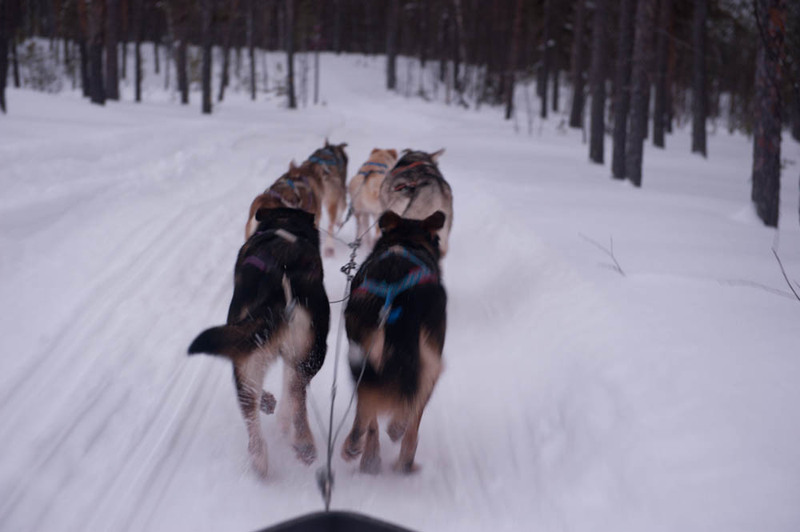 Luckily, I found quite a few activities to keep me busy during the (few) daylight hours as well; the most interesting of these was the opportunity to go dogsledding in nearby Jokkmokk. I don’t think I have ever felt so welcomed on a tour before.I didn’t even have to wait until the tour started to meet one of my guides. Instead, he came to my door the day before to ask me if I would be interested in a sauna after my sled (of course! ), and later on that day I got to meet the adorable Milou — a Jack Russell that bolted out of Juha’s car and into my apartment as soon as I opened the door. 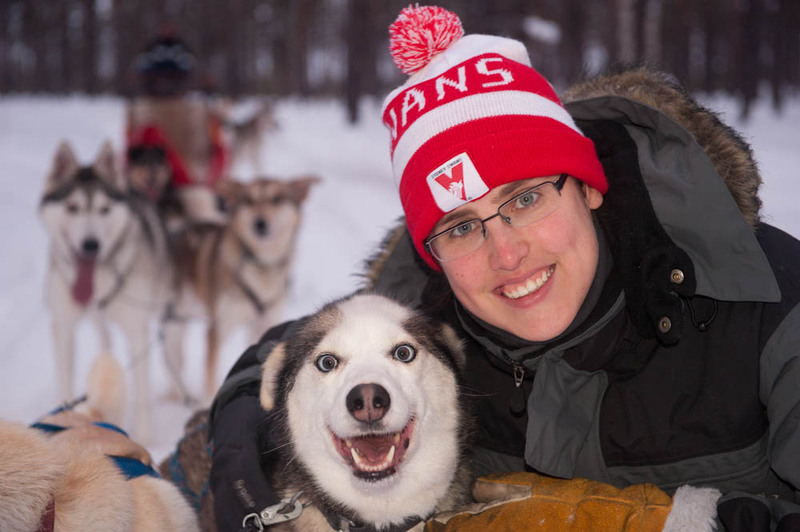 The next day, the other owner of Arctic Husky Adventures, Karin, took me into their home — the backyard of which houses the eponymous arctic huskies — and pulled out a huge assortment of warm clothing for me to bundle up in. I was so glad for this too. The boots were taller and had thicker inner linings, the jacket was even thicker than mine (and it didn’t matter if it ended up smelling like dog), and the gloves were like instant heaters in how quickly they warmed up my hands. Tubas smiling for the camera. Then it was time for the real meet ‘n’ greet with the huskies. Juha explained to me that the dogs were very well trained but that they are always excited to meet new people that they will be sledding with. This meant big bear hugs from all ten dogs. Some barely reached my chest, while others, like Tubas (one of the lead dogs) was nearly taller than me when standing on his back legs! Funnily enough, the shortest dog (Milou) was the boss of all the sled dogs and made sure they knew it. Once I’d met all the dogs, they were harnessed and I was shown my sled. 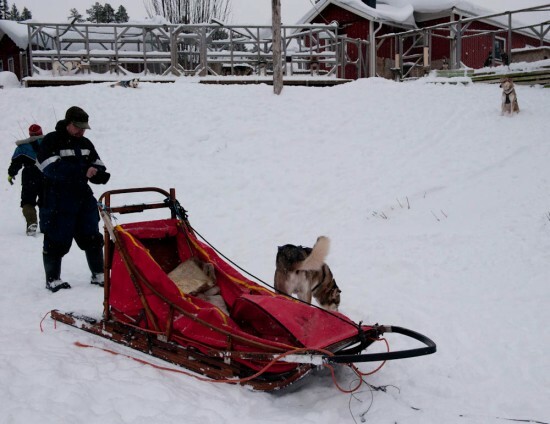 Juha was to be my driver and I would be sitting in the sled, which was their custom-made sled for handicapped visitors. When rigged the correct way, a disabled person can sit in the sled and actually steer it themselves, which I thought was pretty amazing. It also had a built-in seat that was covered in rugs to make it nice and comfortable, and importantly, I was zipped into the sled so I could hide your hands (and legs) underneath the canvas and stop them from freezing in the biting wind. During the preparations, Juha told me all about how the dogs are trained and what they aim for in their training. I’m no expert on Arctic huskies, but I could see his words in action. 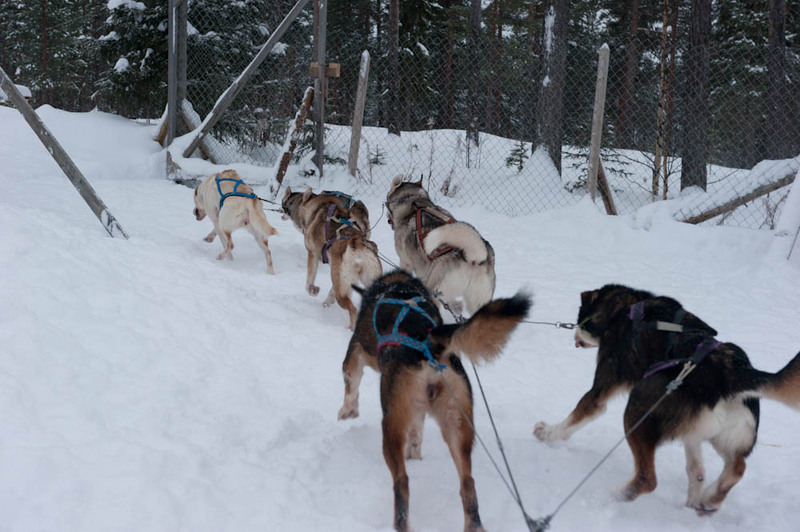 The dogs were completely calm once harnessed to the two sleds; they weren’t howling, running, or otherwise causing a ruckus. They knew what they were going to do and were ready. They truly were something for Juha and Karin to be proud of. Juha was able to spend all this time explaining things to me because there was only one other person on the tour (a friend of his from Finland who was driving his own sled). Their tours can accommodate a few extra people but they always keep the numbers down so you can get a very personal experience. There are very few things in life that match the sheer exhilaration of taking off. Sure, it wasn’t Santa’s sleigh taking off into the open skies, but I think the adrenaline rush was probably close. As soon as the gates were opened, the dogs got to their feet and began to howl (which, Juha yelled to me, was the only time it’s ok for them to howl because it shows how excited they are). Then, with a word, we were off. Through the gates, around the house, down the driveway, and onto the main road we went, flying along between banks of snow. We were truly barreling along, pulled by the speed of six very excited and happy dogs. The lead dog, Liza Minnelli, responded immediately to every word Juha yelled, and in turn, the other 5 followed her every step. It was a joy to watch. Soon enough, we were off the main road and sprinting across a lake. The sense of isolation was immense.Yes, there was a trail (and a snowmobile carrying Karin off in the distance), but otherwise, we were alone. Everything around us was white — or at least as white as it could get in the dull light of a sun struggling to get over the horizon. The occasional house dotted the shoreline — the Swedish way, as Juha explained — and the occasional bird flapped away from the snow-coated pine trees. The dogs panted and their paws flashed across the snow, barely crushing it beneath them. The dogs making their way across a frozen creek. I felt at peace and in awe all at the same time.I snapped a few pictures but otherwise just spent the time looking around and trying to take it all in. Eventually, we left the ice and began bouncing up and down tracks that had been churned up by snowmobiles. Karin got stuck at one point so she switched places with Juha, which was great because I got to hear her commentary as well. Soon, we passed a sign pointing out that Jokkmokk was 20km away; we truly were out in the wilderness. 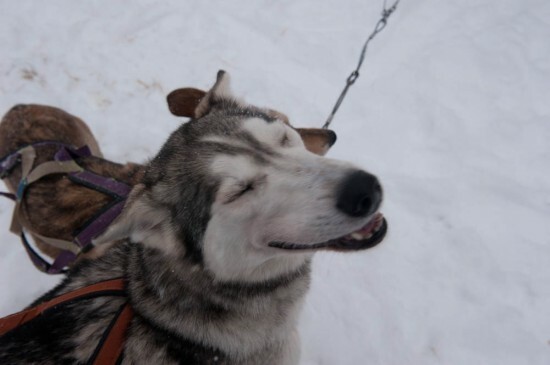 I bundled myself up a bit more in the sled and enjoyed the ride. Eventually, Karin yelled a command and Liza Minnelli stopped the sled just outside a little hut overlooking a river. Karin told me about how late the snow had come this year and how it had wreaked havoc on their normal tracks because many bodies of water, like this one, were not frozen as they should be. I was happy that it wasn’t quite frozen though. It made me feel even more disconnected from the city, work, and everything that comes with it to be standing ankle-deep in snow while listening to the roar of the water below. 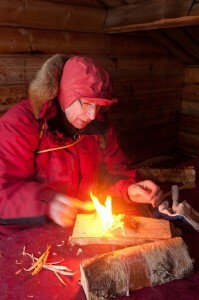 Juha demonstrating the life-saving skill of making fire…and then cooking on it. It was here that we ate lunch and watched the “sunset” (at 1pm). And lunch wasn’t a normal picnic affair of sandwiches and tea. Instead, Juha demonstrated how to create fire from scratch and then built a fire above the snow to cook lunch on, which was quite impressive and provided some much-needed warmth in the -10C weather! 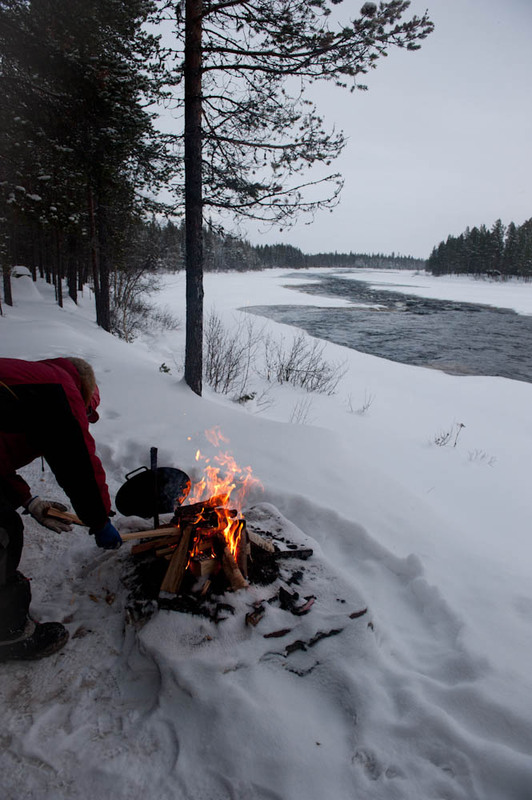 While he cooked, Milou snuggled up in her sleeping bag on the bench and we all sipped hot lingonberry juice. Soon, lunch was ready and we all dug into our meal, a dish similar to a stir fry with veggies, crème fraiche, and reindeer. It was a great introduction to reindeer (which I found much less gamey than venison) and I went back for seconds…and thirds. 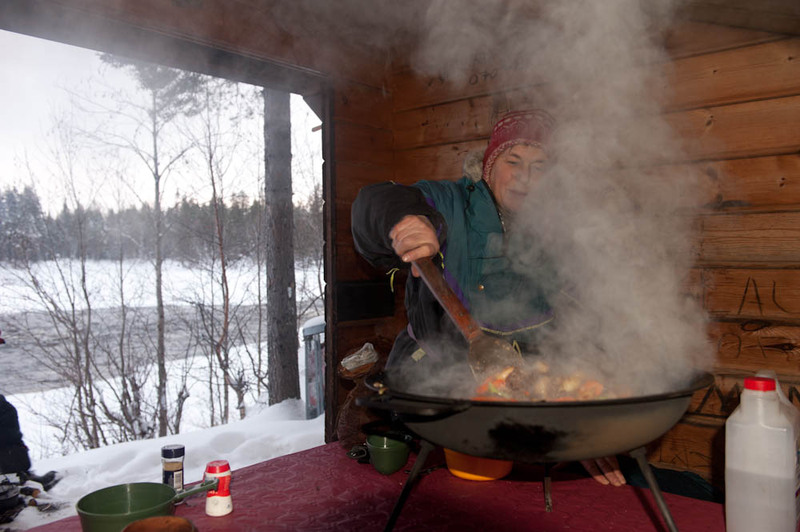 Karin serving up our reindeer lunch. Yum! On the way back, Juha called a halt in the middle of the woods and said that I should get a picture with the dogs before it got dark, especially because I apparently have “husky eyes.” I got a bit of a shock when I got out of the sled and fell thigh-deep into the snow while the dogs sat happily on top of it! I eventually made it to the front and got my pictures with the adorable Liza Minnelli, who seemed more interested in looking at me than at the camera! Juha called another stop when we got back to the ice, but this time he told me that it was my turn to drive! 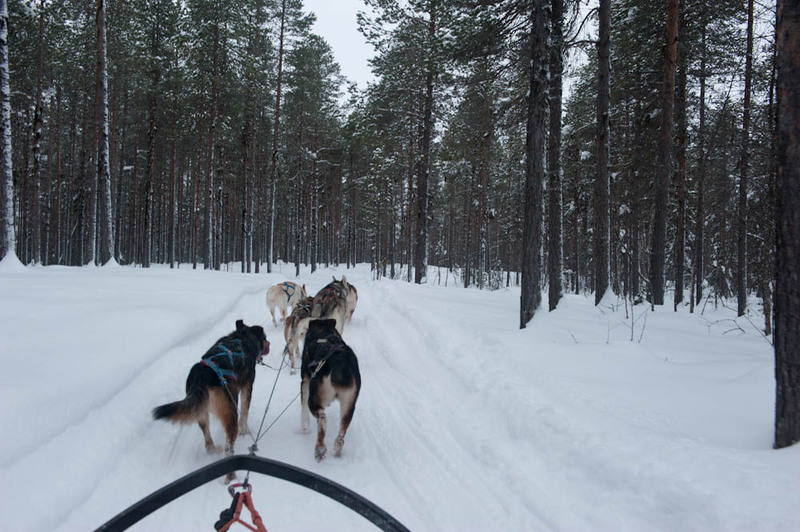 After a few instructions, I put my feet onto the back of the sled, made sure I knew where to grab the brake, and timidly yelled “Liza, Go!” It seemed she didn’t want to budge, but as soon as Juha yelled out, we were on our way again. Things got a bit hairy as we went over an island. Juha fed me a constant stream of instructions as I took one foot off the sled and did my best imitation of Fred Flintstone to help push the sled up the hill. At least this was at a slow pace; once we got to the top of the hill, we picked up pace and began bouncing from side to side. I did my best to lean in the direction needed to keep the sled on track but we found ourselves going through deeper and deeper snow and occasionally feeling one of the runners attempt to lift from the ground. We found the path again and I ground the brake hard into the snow, attempting to get rid of the slack in the dog’s line so we didn’t go hurtling into them. 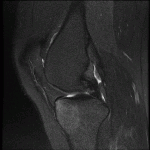 Somehow, we made it to solid ice again in one piece and on both runners. I was proud of myself, and I think Juha was more than a little happy that he didn’t have to dig a sideways sled out of a snowbank! Snow being churned up as the dogs run downhill. Unfortunately all of these experiences must come to an end, and soon enough we were pulling back into the dogs’ yard. After they were let out of their harnesses, they did the funniest thing — rolled back and forth and covered themselves in snow! Juha’s friend explained that it was warming them up, although I couldn’t understand quite how coating yourself in a cold substance would warm you up, unless you were very cold indeed. In any case, it was quite adorable, and almost as adorable as the husky puppies that came out for a play. Juha and Karin are lucky to get their gloves back after the puppies latched onto them…while they were still on my hands! 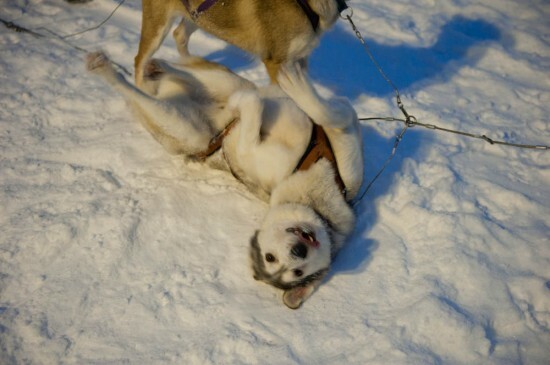 One of the huskies looking adorable as he rolls in the snow. Once the dogs were taken care of, we went back into the house where I was offered a cup of tea and a place on their couch to watch the Tour de Ski (and a sauna, but that’s a story for another day). We chatted about their longer tours, including a 7-day tour that I would love to go back and do, especially because it involves mountains and a chance to see the northern lights at their clearest. A friendlier couple I have not met. They did everything they could to make sure my day was perfect and it was, because of them, because of their dogs, and because of the untouched wilderness they took me through. 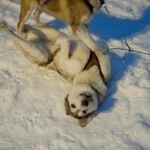 Arctic Husky Adventures offers a number of trips during the winter months with their special team of huskies. I took the 3-4 hour lunch trip (which was at least 4 hours including preparation) that cost 1200 SEK. 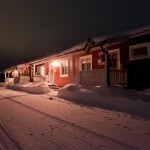 The price includes transfer to and from Jokkmokk bus station. 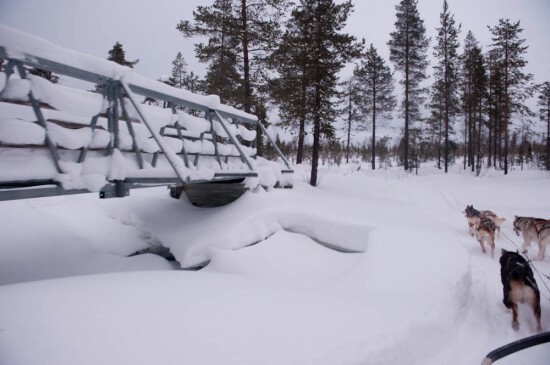 Jokkmokk itself is a town north of the Arctic Circle in Sweden’s Norrbotten County. It is accessible via Länstrafiken Norrbotten bus lines, which run regularly from Gällivare and Luleå. Flights are available into Luleå and Arctic Husky Adventures will arrange transport to Jokkmokk. Yes, it really was. So glad that I went on it…and that it was pre-giant-snowstorm so it was only -10C instead of -47C like last week! Also, I forgot to mention that it’s one of the few “adventure” activities I’ve done where I could take my SLR! So glad I did too, because my point and shoot would not have been able to handle the low light…although I guess the dogs as streaks would be an interesting effect too. Sounds like an amazing experience! I would be afraid to take the reigns like you did. Knowing me, I would steer everyone into a snowbank. The dogs are too cute! Thanks, it really was amazing! I was a bit concerned about taking the reigns, but I was told I’d only be going over ice (only to find out that it was ice plus an island in the middle). I was convinced we were going into a snowbank and were going to flip but I somehow avoided that, which I’m sure Juha was happy about. The dogs were definitely adorable and so sweet. I’m so glad that we were allowed to play with them, and it was great to see that they are so well taken care of. Yes they are! It really made me want one, although having a husky in sub-tropical Queensland would be a bit cruel!